The Japan Aerospace Exploration Agency (JAXA) has been engaged in collecting and categorizing particles in the sampler container (*1), which was brought back by the instrumental module of the asteroid exploration spacecraft "HAYABUSA" from asteroid "Itokawa." As part of this effort, JAXA has been conducting the initial analysis (*2) of particles identified as rocky using scanning electron microscope (SEM) observations, which were collected from sample catcher compartment "A." As a part of achievements of the initial analysis, six HAYABUSA research reports were published in the "Science Magazine" dated August 26, 2011. In addition, the cover of this magazine features these achievements. This is also epoch-making news since the special issues that the asteroid explorer "HAYABUSA's" neighborhood observation on asteroid "Itokawa" in June 2006, the solar observation satellite "HINODE" in December 2007 and "KAGUYA" in February 2009. *1 The HAYABUSA sampler container consists of 2 compartments that are called Sample Catcher A and B. *2 "Initial analysis" means the analysis of typical particles to obtain information necessary for categorizing (identification, classification and numbering) as a part of curation activity (*3). *3 "Curation activity" means the retrieval of particles, preservation, categorizing and allocation and their necessary analysis. A small rocky particle, 150 microns in size, brought buck from asteroid "Itokawa " by the asteroid exploration spacecraft "HAYABUSA." 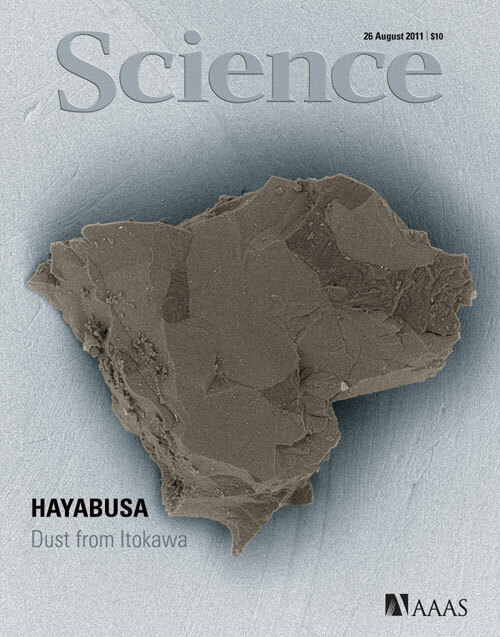 Abstract: The Hayabusa spacecraft successfully recovered dust particles from the surface of near-Earth asteroid 25143 Itokawa. Synchrotron-radiation X-ray diffraction and transmission and scanning electron microscope analyses indicate that the mineralogy and mineral chemistry of the Itokawa dust particles are identical to those of thermally metamorphosed LL chondrites, consistent with spectroscopic observations made from Earth and by the Hayabusa Spacecraft. Our results directly demonstrate that ordinary chondrites, the most abundant meteorites found on the Earth, come from S-type asteroids. Mineral chemistry indicates that the majority of regolith surface particles suffered long-term thermal annealing and subsequent impact shock, suggesting that Itokawa is an asteroid made of reassembled pieces of the interior portions of a once larger asteroid. Abstract:Meteorite studies suggest that each solar system object has a unique oxygen isotopic composition. Chondrites have been believed to be derived from asteroids, but oxygen isotopic compositions of asteroids themselves have not been established. We have measured by secondary ion mass spectrometry oxygen isotopic compositions of rock particles from asteroid 25143 Itokawa returned by the Hayabusa spacecraft. Compositions of the particles are depleted in 16O relative to terrestrial materials and indicate that Itokawa, an S-type asteroid, is one of the sources of the LL or L group of equilibrated ordinary chondrites. We have the first direct oxygen-isotope link between chondrites and their parent asteroid. Abstract:A single grain (~3 μg) returned by the Hayabusa spacecraft was analyzed by neutron activation analysis. This grain is mainly composed of olivine with minor amounts of plagioclase, troilite and metal. Our results establish that the Itokawa sample has similar chemical characteristics (Fe/Sc and Ni/Co ratios) to chondrite, confirming that this grain is extraterrestrial in origin and has primitive chemical compositions. Estimated Ir/Ni and Ir/Co ratios for metal in the Itokawa samples are about five times lower than CI values. A similar depletion of Ir was observed in chondrules metals of ordinary chondrites. These metals must have condensed from the nebular where refractory siderophile elements already condensed and were segregated. Abstract:Regolith particles on the asteroid Itokawa were recovered by the Hayabusa mission. Thee-dimensional (3D) structures of these particles examined by X-ray microtomography give information for comparison with meteorites and about regolith formation. Modal abundances of minerals, bulk density (3.4 g/cm3), and the 3D textures indicate a mixture of equilibrated and less-equilibrated LL chondrite materials. No particles showing melting were observed. 3D shape features of these particles (size and shape distributions, and the presence of particles with rounded edges) are different from the lunar regolith and suggest that they were formed by meteoroid impacts on the asteroid surface, and eroded by seismic-induced grain motion in the smooth terrain. The results indicate that the returned samples are a good representation of the surface materials on Itokawa. Abstract:The reflectance spectra of the most abundant meteorites, ordinary chondrites, are different from the abundant S-type asteroids. This discrepancy hasbeen thought to be due to space weathering, which is an alteration of surfaces of airless bodies exposed to the space environment. Here we report evidence of space weathering on particles returned from the S-type asteroid Itokawa by the Hayabusa spacecraft. Surface modification was found in 5 out of 10 particles, which varies depending on mineral species. Sulfur-bearing Fe-rich nanoparticles (npFe) exist in a thin (5-15 nm) surface layer on olivine, low-Ca pyroxene, and plagioclase, suggestive of vapor deposition. Sulfur-free npFe exist deeper inside (<60 nm) ferromagnesian silicates. Their texture suggests formation by metamictization and in-situ reduction of Fe2+. Abstract: Noble gas isotopes were measured in three rocky grains from asteroid Itokawa to elucidate a history of irradiation from cosmic rays and solar wind on its surface. Large amounts of solar helium (He), neon (Ne), and argon (Ar) trapped in various depths in the grains were observed, which can be explained by multiple implantations of solar wind particles into the grains, combined with preferential He loss caused by frictional wear of space-weathered rims on the grains. Short residence time of less than 8 million years was implied for the grains by an estimate on cosmic-ray.produced 21Ne. Our results suggest that Itokawa is continuously losing its surface materials into space at a rate of tens of centimeters per million years. The lifetime of Itokawa should be much shorter than the age of our solar system.